„An electro-mechanical action?“ This question will definitely be on the tip of a few tongues. Actually, the type of mechanical action was a big issue during the design phase. Since the intended concept was not originally planned as a pure restoration but rather to rebuild the missing components, building a new pneumatic mechanical action was out of the question. So the smart solution was chosen, that is, to make the controls electric right up to the windchest but to still restore the complicated bellows system within the windchest. This solution, which was made possible by the parish community’s wish for a mobile console, approaches the original controlling principle more than would have been possible with a purely mechanical solution. Moreover, the historical materials of the windchest were almost fully re-utilised. Next to the compelling concept, the agreement over the windchests was a determining factor in the decision to give the contract to Schulte. Intensive trials with the pallet operation bellows displayed a propensity for repetition, exactly what Binns was famous for and which, here in these parts, is seldom found in comparable instruments. During the early design phase, the organ builders already anticipated that special attention would have to be paid to the swell effect. 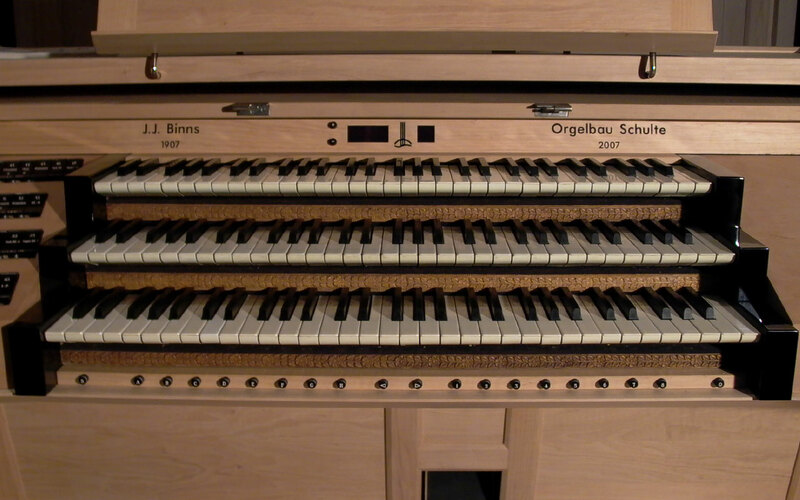 The organ’s unique sound definitely required an extremely flexible swell range. So Oliver Schulte actualised what had been on his mind for a long time: a swell box construction made in a massive sandwich style with 2 outer layers of 18 mm thick spruce, filled with 40 mm quarz sand. The individual, one square meter large swell chambers were correspondingly heavy but the spectacular outcome speaks for itself!